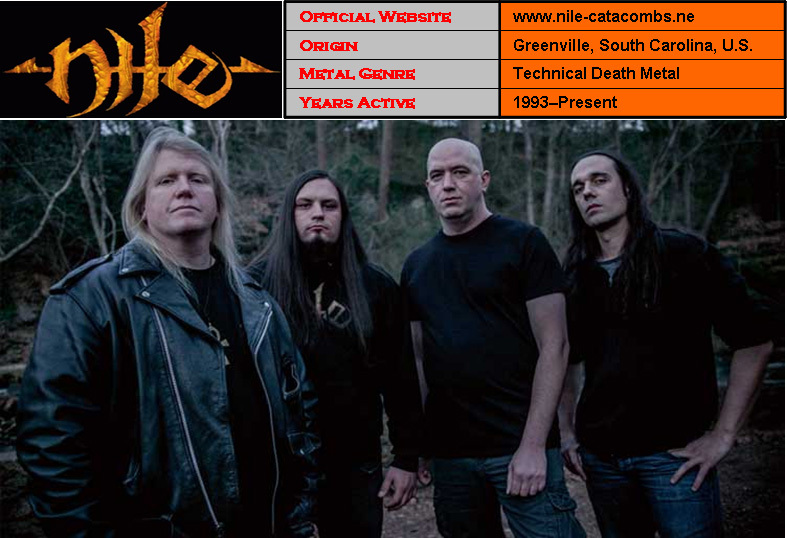 Nile is an American technical death metal band from Greenville, South Carolina, United States, formed in 1993. Their music and lyrics are inspired by Ancient Egyptian/Near Eastern mysticism, history, religion and ancient art, as well as the works of H.P. Lovecraft. Nile formed in their hometown of Greenville in 1993, from the ashes of a previous band Morriah in which Karl Sanders played since the 1980s. Karl Sanders (guitar/vocals), Chief Spires (bass/vocals) and Pete Hammoura (drums) debuted with their Festivals of Atonement EP in 1995, leading Nile to a southwestern tour in support of other big metal acts such as Obituary, Deicide and Broken Hope. For Metal Evolution, Sam Dunn presented a new, updated version of his “Heavy Metal Family Tree“, a 24 sub-genre chart that mapped out Metal’s various sub-genres that have spawned over the course of its 40-year history. This new, more elaborate version included a “Pre-Metal” field that listed non-metal musicians that had an influence on Heavy Metal. 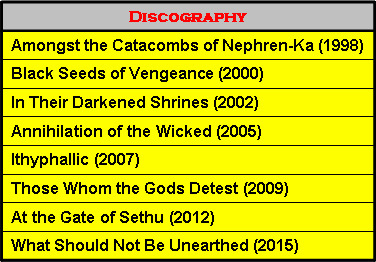 It also listed additional bands as examples of the various styles of Metal. 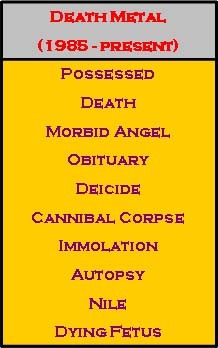 Death Metal is an extreme sub-genre of heavy metal music. It typically employs heavily distorted and low tuned guitars, played with techniques such as palm muting and tremolo picking, deep growling vocals and screams, aggressive, powerful drumming featuring double kick or blast beat techniques, minor keys or atonality, abrupt tempo, key, and time signature changes and chromatic chord progressions. Very few genres of music incorporate as broad a palette of distinct sounds as Heavy Metal. From the technicality and musicianship of bands like Iron Maiden to the raw power of Mastodon, Heavy Metal offers a seemingly endless array of musical possibilities. Heavy Metal began as an attempt to play louder and faster than ever before, but it evolved into a nuanced and highly complex form of expression enjoyed by millions all across the world.